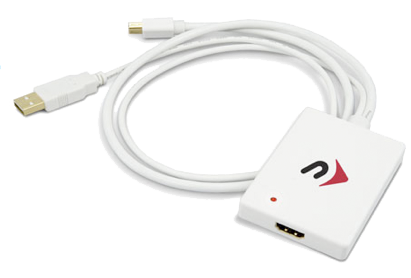 The easiest and quickest way to send your Apple laptop computer video and audio to a modern television is with NewerTech’s Mini Display Port + USB Audio to HMDI Adapter. In less than two minutes you’ll be watching either an identical mirror image of what is on your computer’s screen, or using the HDMI television to span your computer’s Desktop across two screens: one tiny and one enormous. Resolution up to 1080p is native. Picture and sound quality are great, thanks to the USB audio cable that is part of the adapter hardware. Telephone, web, and email tech support from NewerTech will guide you if you don’t understand the last sentence in the paragraph above. Your HDMI television’s remote control has an INPUT button that will be needed to select the HDMI port being used with the NewerTech adapter. Your Mac’s System Preference > Sound > Output may have to be set to USB Audio, and the Displays Preference may have to Detect Displays the first time you connect. One minor grumbles: the three foot cable length is a bit short — a six foot and ten foot version would also be nice. Aside from that suggestion, MyMac strongly recommends this innovative, easy-to-use, set-it-and-forget-it product, with a MyMac Review Rating of 9 out of 10. Atlona takes a different and more generic approach to HDMI conversion. 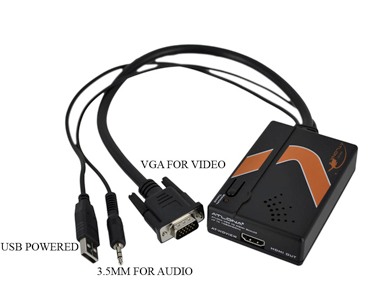 Their VGA with Audio to HDMI Converter/Scaler does not include a HDMI cable. You need to provide your own. What are included are a USB cable for power, a 3.5mm audio cable for sound, and a VGA cable for video. Wait! VGA = Windows, not Mac, so you’ll need either an Apple or Atlona adapter to convert VGA to DVI, Mini Display, or whatever your computer’s external video port is. With my pre-unibody 15″ MacBook Pro, the Atlona adapter fits and functions perfectly up to 1920 x 1200 resolution. Setup and configuration are not as straightforward as with the NewerTech Mini Display Port + USB Audio to HMDI Adapter, which is Mac-ready out of the shrink wrap. What makes the generic VGA Atlona device suitable for Macintoshers is when occasionally you have to use a Windows tower or laptop instead of a Mac. When I have to do a presentation from the Windows computer where I work part-time, that VGA option is essential. If you are all Mac all the time, the Atlona converter is not a priority, but for people who are switch hitters, this product receives a MyMac Review Rating of 7 out of 10, in spite of being a little pricey. It has a three year warranty, and a slim printed User Manual.